Technology has transformed telecommuting from a drab agoraphobic life, where your cat and your pajamas are your only creature comforts, into a multi-tasking, jet-setting lifestyle whose only tie is to a strong data connection. Whether you’re running your coffee-roasting business from a smartphone while traversing the globe in search of the perfect bean or you just don’t want to have to pull your kids away from their sandcastle to go sign off on that proof, it is possible to cut the office cord and maintain your productivity and professionalism. When I said goodbye to the cramped office where I worked as a magazine editor for 8 years and dragged my family of four cross-country to Charleston, South Carolina, all it took was a few pieces of hardware and a lot of organization to enable me to write, edit and produce the magazine sans office. And yes, some of that work was done on a beach. Working remotely requires an investment in optimal hardware. Remember, you no longer have a grouchy IT guy buried in the basement to fix your every issue. Set yourself up for success with the best hardware your budget can stretch too. My remote office is comprised of a MacBook Air, an iPhone 5 and an iPad. Nine times out of 10 I can do everything I need on the two mobile devices. 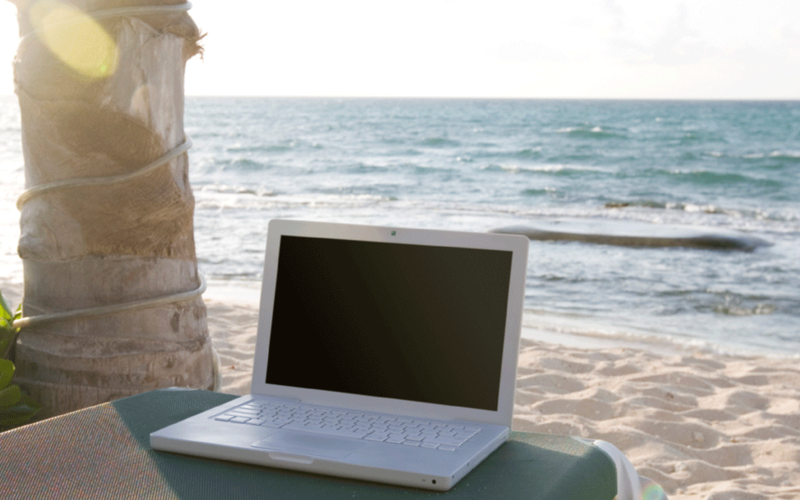 Remember the ABCs of a mobile workday: Always Be Charging. Cutting the office cord also means the power cord. I never run out of juice through a combination of an in-car charger, a Mophie Powerstation, and taking advantage of every outlet I spy (yes, that includes a bathroom… ). Get to know your new best friends, LTE and WIFI. Speed is essential when working remotely. I upgraded to an iPhone 5 which gives me speed and a mobile hotspot, essential for surfing the web on my WIFI iPad while watching my kids surf some waves. Before kissing those plastic office pot plants goodbye, set up strong links with the office network and the colleagues you’ll be working with remotely. I installed LogMeIn on my networked office computer and TeamViewer on the computers of the colleagues I collaborate with. LogMeIn lets you to access the computer it’s installed on from any device you choose, including tablets. TIP: Unless you have blazing fast WIFI connections on both ends, remote access can be fiddly and time-consuming. To avoid having to use it for too long, I put files I need to transfer to the network into a Dropbox folder linked to the office computer. Then I can simply logon, drag and drop and get out of Dodge before the WIFI implodes. TeamViewer allows you to see the desktop of your office-bound buddy and for them to see yours (and unless you turn on the camera, they won’t see the palm trees behind you). It also lets you control that desktop, with his or her permission (this is the main difference from LogMeIn). For my workflow this was ideal for collaborating with the magazine’s designer in programs such as InDesign and Photoshop, meaning no need to purchase expensive software not essential to my daily workflow. Dropbox: My number one rule for working remotely is never, ever email files. It will not end well. My designer and I share a Dropbox folder that we ferry all the files back and forth through. This helps avoid the pitfalls of working on the wrong document (“No, no, it’s the one attached to the 5th email I sent you, not the 3rd.”). Flickr is also a useful way to share large photo files. TIP: Tell your obsessive-compulsive colleague not to delete files from the Dropbox folder just because he doesn’t need them anymore – this will also delete them from your folder. Set up a TRASH folder that files can be moved to by collaborators, and then removed by you – when you are ready. Google Docs: Eighty percent of my work involves creating and editing content. I use Google Docs to access, edit or create files from any device, in any location completely cross platform (my office works on Windows PCs). When I finish with a story I download it from Google Docs as a .docx file and save it to Dropbox. TIP: Dropbox pushes a notification to any computer linked to a shared folder when there’s a new file. However, if that person is not at their desk at that exact moment, they’ll miss it, so I always follow up with an email. Apps: For the cloud to work for you and not against you, you need to have access to your files on all your devices and be able to access them from someone else’s device. (Yes, I did use a babysitter’s iPhone to upload a document when mine had run out of juice). All of the software I use has either a web-based version or a mobile app. Make sure you install each application across all your devices, and if an app doesn’t support one of your devices, find one that will. The biggest hurdle when cutting the cord from your office is perception. Often the aforementioned office thinks you’re sunbathing on a beach somewhere and not doing any work. While this may be partially true, being always available, even outside office hours, helps quash any doubts. My iPhone let me be knee-deep in the Atlantic Ocean when my publisher wanted an emergency Skype call, and elbow deep in the children’s bubble bath when my designer was IM-ing me trying to locate a missing PDF. For this, encasing my iPhone in a waterproof, sand proof Lifeproof iPhone case was essential (yes, it did visit the bottom of the ocean, and yes, it survived). TIP: A good instant messaging client is an essential tool to keep communication flowing. I work over Yahoo IM, because it was installed on every computer in the office sometime in the last century. While I would have chosen something a little slicker (and less purple), using tools your team is already familiar with helps immensely in bridging the office-cord-cutting gap. Hit the sand, sea or open road. The world is now your oyster. Jennifer Tuohy is a freelance journalist, editor and social media consultant based in Charleston, South Carolina. Jennifer regularly writes about gadgets and technology for eBay.com.